Early Superman is great. Obvioulsy you can't write Superman like that now, but DC should create a new character who's a thinly disguised early Superman and play him off the modern heroes. Modern Superman arriving too late "You didn't save him!" Early Superman stand-in: SHRUG. "No. Why would I? He'd have gotten the death penalty soon enough anyway." Boy, talk about decompression! Seven strips and Kypton still hasn't exploded yet? Amazing! The more I read of early Superman, the better it gets. I don't think anybody would have the guts to write a mainstream superhero with the edge that early Superman has. It is so great to have this new aspect of such a familiar character opened up to me after all of these years. Thanks. That could well be. I should check my DVD and see if the extras shed any light on this. And the two aren't necessarily mutually exclusive. It's possible that they couldn't think of any other solution but also were leaving it to the viewers to decide how manipulative Supoerman was being. Interestingly when I looked up the episode on TV.com I found it was based on a radio episode with a similar ending. Since the radio show aired years earlier, that could partly explain the edgier tone. Obviously the other example, with the poison gas is less ambiguous. Superman definitely knew the criminal was dying right in front of him. Andy, I'm not so sure about that one. He told them to stay put until he figured out what else to do with them. I think that the real issue is that the writers couldn't figure out what else to do with them. Just more evidence that Superman is a…well, you know. "The biggest surprise in early Superman stories is that Superman is too much of a bully." It sometimes went well beyond bullying. There was that time hee causally talked to a criminal who was dying of poison gas. And on the original TV series a criminal couple discoverd his secret identity so he stranded them in a precarious location in the Arctic and told them not to move until he decided what to do with them. There's a definite hint that when they fell to their deaths they were doing what he hoped they would do. Hmm, Superman vs. Bernie Madoff, the epic confrontation that YOU demanded. I smell multi-part crossover material here. Mattel can produce the action figures. Sometimes "exclusive" means exclusive to the planet Earth, at least until the first moon base is established. Sometimes "available for a limited time only" means until the rapture occurs or Mars collides with Earth. I also love the early Superman. Especially as I am a booster of the "Clark is the disguise" Supes. Despite his very human and humble nature, he is this force beyond humanity. Something like Lois may threaten to bring him down to our level, but no dice. I find it interesting that in the original version of Superman's origin, the Kryptonian's were portrayed as an entire race of Supermen. Thus explaining Clark's amazing abilities compared with us average Earthlings. I wonder if this was changed in later years because they kept continually increasing Superman's powers in the comics? He went from leaping tall buildings in a single bound, to actually flying. From being faster than a speeding bullet, to being faster than the speed of light. From being tough enough to survive anything short of a bursting shell, to being completely and utterly indestructible. From being strong enough to lift a car, to being strong enough to move a planet. Eventually he could even freely travel through space with no need for protective clothing or oxygen. So it would stand to reason that, if everyone on Krypton had these same powers, then everyone would have survived the destruction of Krypton and just flown out into space at the speed of light until they found another suitable world to live on. So, I suppose to explain that away, the writers had to come up with another reason that Clark had powers here on Earth, but that everyone on Krypton was just a normal, non-superpowered being. So they came up with the explanation that Krypton's sun was a red giant which gave the planet Krypton a much higher gravity than Earth's. Thus anyone from that planet would gain super strength in our lighter gravity. (Kind of suspect logic there). So, lighter gravity gives you super-strength, super speed, invulnerability, x-ray vision, heat vision, super-cold breath, telescopic vision, etc., etc. Riiiight. I actually prefer the earlier version of Superman. His origin and power's. He was much more interesting then, IMO. They should have left him like that, (except maybe for the flying, that doesn't bother me so much). In fact, I think the perfect version of Superman was the one from the old Fleischer cartoons from the 40's. I thought in those, he was portrayed with the perfect level of powers and abilities. The biggest surprise in early Superman stories is that Superman is too much of a bully. In one early radio program (once available on cassette tapes), he is too quick to reveal his secret identity to someone, for some weak reason, but then threatens him with harm if he reveals it. As late as 1950, in the first movie serial, pre-Warren Court Superman throws a gangster up in the air, repeatedly, to elicit information. That's an enhanced interrogation technique. Superman's appearance and demeanor softened, over a four-year period from 1948 to 1952. I've been under the impression that Mort Weisinger was responsible. This was just after Siegel and Shuster left DC. It's to be expected that the strip would be carefully drawn, when DC was trying to sell it to syndicates. 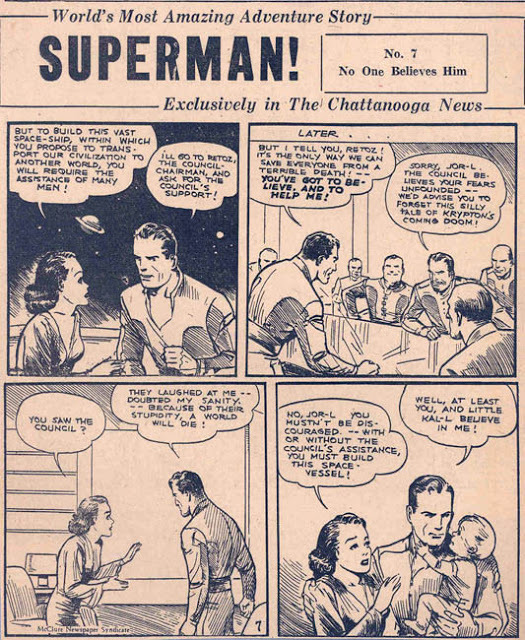 I wonder if part of the reason Jerry and Joe had difficulty selling Superman to newspaper syndicates was the unflattering portrayal of newspaper reporters in the early stories. Lois and Clark are portrayed as selfishly pursuing scoops, not as the altruistic crime reporters they were later. That's fairly adult, for a comic-book in the 1930s. Reporters for a competing paper were depicted as thugs. Pivoting off of Mars's comment, it's pretty clear that Siegel and Shuster were also drawing heavily on their Jewish backgrounds as well–I mean, right here, you have people from a world on the verge of destruction (a destruction warned about, but those warnings go unheeded) sending their child to a far-off land of promise. That sounds an awful lot like the Jewish immigrant experience of the late 1930s. Not that this is an original observation–Michael Chabon was clearly riffing on this theme in Kavalier & Clay. Tom Brevoort, thanks for those links! Yep, I was aware of the comic strips, but I never saw scans from the actual newspapers that they were printed in. Very cool! Thanks for sharing them, Jim! There is a wonderful wish-fullfillment quality to the Superman stories in the first year of publication. What young boy, bullied at school, hasn't dreamed of being strong and powerful enough to take on the bully and maybe protect other kids as well. The Superman of 1938 is an extension of this, taking on the social injustices of the world around him and protecting the honest and good from the corrupt and the powerful. In the first year, Superman took on a wife beater, a munitions manufacturer, a mine owner who put profits before safety and a crooked American football coach. Superman replaced slums with decent housing, stopped the torture of prisoners, helped defrauded investors get their money back, declared a war on irresponsible driving and took on a corrupt cab drivers union. All in the first 12 months. Amazing. A very socialist hero. Now I want to find out what newspaper my great, great, relatives published in Chattanooga. Hmmm! 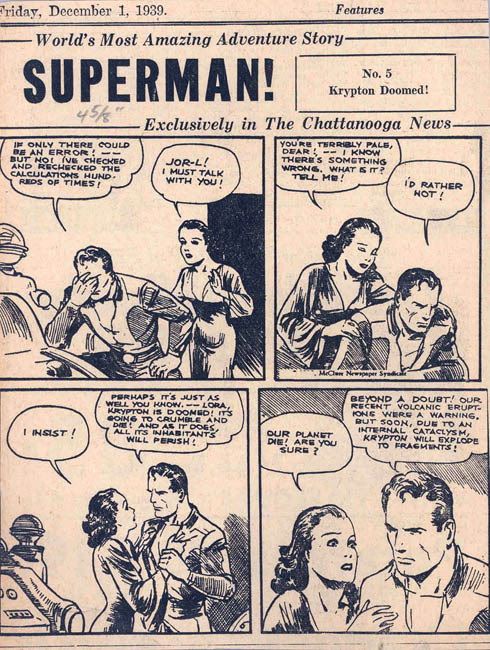 These were reprinted, along with all the following strips, in "Superman: the Dailies 1939-1940", the first of three volumes from DC Comics and Kitchen Sink Press in 1999. The three volumes only take us through to Feb 14 1941, which I thought was a shame since there was a lot of interesting material and DC seems to have put more effort into the strip than into the comics, reflecting the greater prestige strips had at the time relative to comic books. 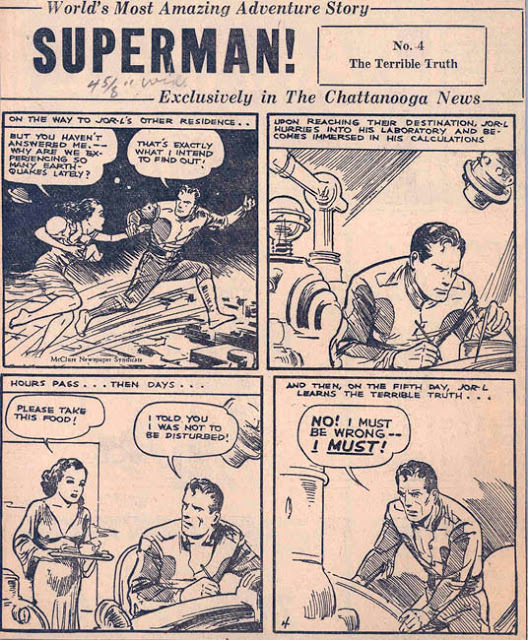 There was also a single volume "Superman: the Sunday Classics 1939-1943", which reprinted the first 183 Sunday strips in colour. Just as an aside, one of my favourite moments is in strip 2 of the Sundays, where Superman is trying to convince a bank manager to advance a loan to a desperate logger who needs the money to hire lumberjacks to cut his trees and get them to the mill before some deadline. "Nice bank you've got here…" he says to the bank manager while hoisting a safe with one hand. "It would be a pity if something happened to it." I remember just going into shock when I first read that panel. 'Th-that's not Superman!' I thought. 'He doesn't say things like that.' Ahh… but it is. And he does. Well, at least according to Jerry Siegel and Joe Schuster (I think, the volume doesn't give credits for the individual strips, but it's a very early one). I should note, strip 2 was actually the third strip: the first one (strip 1A) was a basic introduction and summary of Superman's origin that papers could run when they picked up the strip. Following that is the first story, strips 1-8, called in this volume "Twenty-Four Hours to Ruin". There were also a set of parallel volumes featuring the Batman strip — three black-and-white volumes of dailies and a volume of Sunday strips in colour. These reprinted the entire run of the Batman strip, which didn't prove to be as popular as the Superman one. All of them are well worth tracking down. Well, in my opinion, anyway. Thanks for the explanation. For a moment I thought you had 70-year-old newspaper clippings. Wish my clippings from the 80s looked as good. I second Thunder's thanks. I've got to check out the links that Tom Brevoort posted. Thanks to Jim for posting these (and also to Tom B. for the links). 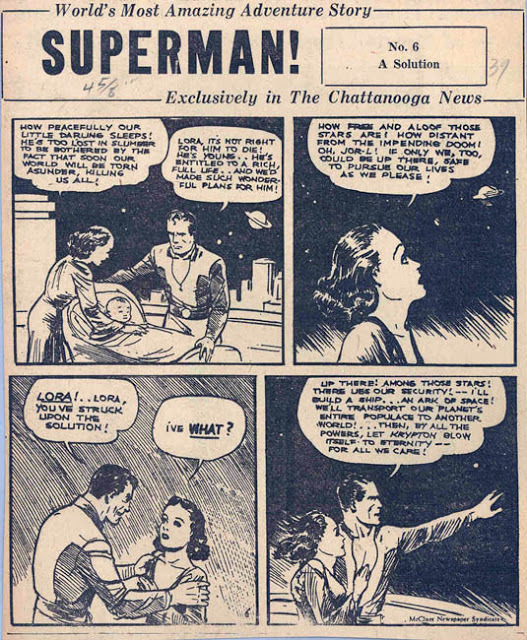 The Superman syndicated strips were given to me when I was briefly being considered as an expert witness for DC in pending litigation, the Siegel and Shuster estates v. DC. I wasn't expert enough on anything pertinent, so no go. But, at least I got digital copies of those cool strips, and, by the way, without help or hinderance from me, the plaintiffs largely prevailed. Yes, the SUPERMAN newspaper strip started in 1939 and ran for a solid thirty-plus years. 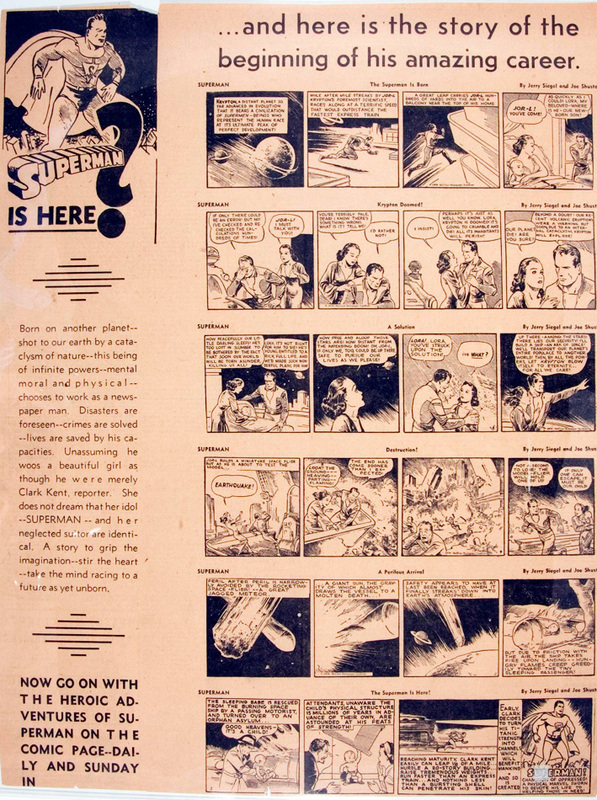 A number of the earliest strip stories were reworked into stories in SUPERMAN #2 and #3. I've known about the Superman comic strip for a long time, but I didn't expect you to have copies of it, much less promotional material for it. Did you receive these when you worked for DC back in the 60s? It's funny to see "exclusive" used to describe syndicated strips printed in more than one paper, even though I realize "exclusive" really means "exclusive to this region" in this context. 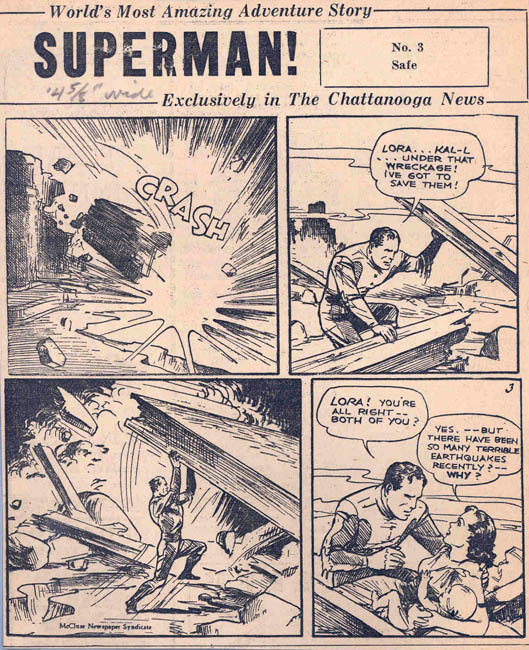 A linguistic aside: although probably everyone, Jerry Siegel included, pronounces "Jor-L" and the later spelling "Jor-El" identically, it just occurred to me that the "L" of "Jor-L" could be pronounced without a vowel as a syllabic consonant like those in some Slavic languages. Or the "L" could blend with "Jor" so "Jor-L" could rhyme with "whorl." "Kal-L" could then be pronounced with an elongated "l" as "Kalllll." I've seen them before somewhere. Perhaps they're in a book I've got of Superman newspaper strips. I'll have to check. Doesn't Joe Shuster's artwork look far better with the 'shading' he gave it?